Love has the ability to sweep you off your feet and this ability is gracefully captured in this heart pendant. The left side of this elegant piece is formed by an effortless swirl of shining 14K white gold, curving like a gentle wave. The right side displays a similar curve, but instead of shining precious metal, it's created with 10 diamonds. These two elements combine in perfect harmony to create a united picture of love. A 14K white gold box chain is included. 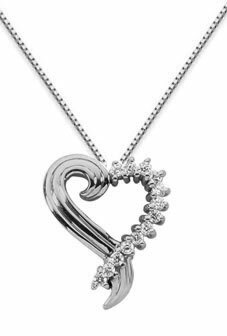 We guarantee our Diamond Swirl Heart Pendant, 14K White Gold to be high quality, authentic jewelry, as described above.